Hello stampers, Sorry for my absence. I've been super busy. My family celebrated birthdays two week ends in a row. I went to an apple festival. I held a stamp camp and I was a demonstrator at out World Card Day event. Plus I am currently involved in two bible studies. I'll share more over time. 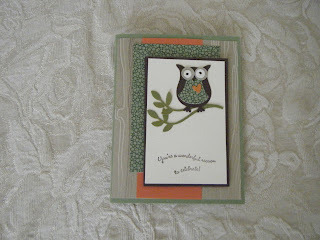 Today I want to show another owl card. I gave this one to fabulous son #2. This layout is similar to the other card I made for fabulous son #1. I used the same products as the previous card. I am having so much fun with the Owl punch. You can find it on page 201 of the Idea Book and Catalog 2010. Cute, cute, cute! Love that little guy and he looks especially happy on your card.